Warm Calling vs Cold Calling: Which is Best for You? Those who are outside the sales world (and some who are in it) think that EVERY conversation that takes place on a phone is “cold calling”. Most inside the industry are at least familiar with the idea of “warm calling”. Even though many have heard and even use warm calls, definitions are quickly muddied and sometimes sales training is lackluster. We’ve actually put together many different training and definition posts. All in the hopes to help everyone from team leads and VPs to new sales reps. You can check out a few of those posts here, here, and here. 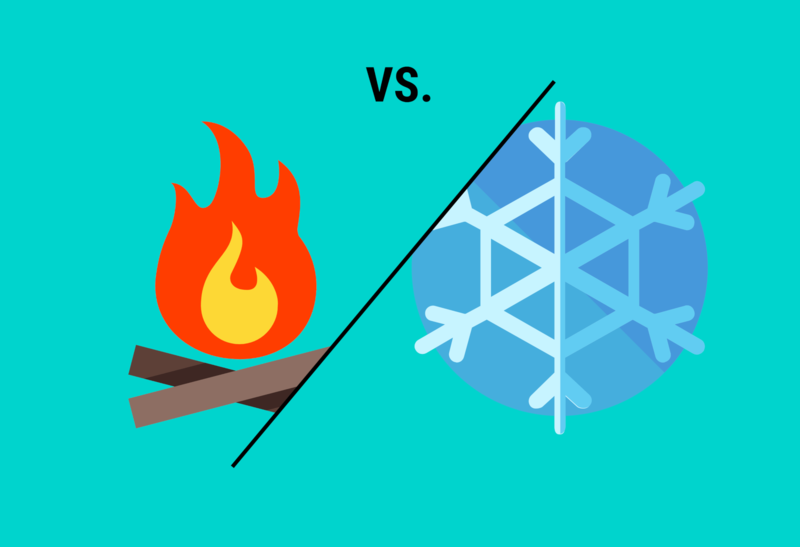 For this training-esque post, we’ll zero in on the difference between warm and cold calling. In the end, a better understanding will help you define and improve your overall sales process increasing the number of qualified conversations and hitting higher numbers. Cold Calling: A sales-facing member of a business or organization making a phone call or visit to an individual, business or organization to solicit goods and/or services. The party contacted has no prior knowledge about the meeting or call. Warm Calling: A solicitation call or visit initiated either by the sales-facing member of an organization. OR the call/visit is initiated by the person or organization that is being solicited. It doesn’t take a Mensa candidate to understand that warm calls have a better ring to them (pun intended). Also, warm candidates are often qualified faster (possibly) equalling more sales off of them. Good question. Let’s try to answer that. So, you just sit at your desk and wait for people to call, right? Of course not. But that’d be cool. Instead, getting a warm call set up is all about starting the conversation via other means of contact. The future of sales is all about being everywhere. If you don’t try at least 2-3 touch points, it’s not likely you’re going to see the kind of sales growth that you’d like. Using one of these to get the fire going is the best way to find prospects that are ready to talk. If they respond to your preliminary communication — they’re likely ready for a serious call. Even still, the best way to warm up a call is to have several things working in your favor. *Spread this process out over a 3-5 business days for maximum results. Four: An email telling them that you’ll leave them alone (e.g. break up email). Compared with cold calling, there aren’t many issues with the warmer version (as you’ll see). That said, there are a few issues to consider. While you’re not sitting by the phone waiting for an ad to work or for people to need you, you are waiting. Waiting for responses to your preliminary contact method(s). Doing so can be difficult for any business that is in the very early stages of startup with no audience and no budget. Depending on how many customers you need to keep your Ramen noodle cabinet full, you may be better off cold calling a few hundred leads and trying to earn your paycheck that way for a couple months. The more complex your sales process, the more likely you are to mess it up when doing it manually. Post-it notes and phone reminders will only take you so far. Some smaller businesses may not even utilize a CRM when they’re starting out (not recommended). There are (ahem) tools that can automate your cold contacts in a way that leave you only responding to those warm leads. However, if you’re not ready to beef up your sales (and tools), just plain cold calling may be better. There are so many people who think that cold calling is the only way to conduct business. While this was relatively true, especially during the ’80s, it’s not the best method today. Making calls to strangers is no longer a viable method for growth in ANY* industries. *Any meaning that a call made to a stranger (they don’t know you, you don’t know them) as a means of making significant sales. There is an in-between method that we’ll go over a bit further down. If you’re buying a list of leads only to call them on the phone with little to no research — get with the times. This archaic method of sales is so awful, we’re not even going to write about it any more. We’re going to talk about warm-ish calling, lukewarm calling, or even not-so-cold calling — whichever you prefer. None of those would have been compelling though. Lukewarm Calling: A call or visit by a sales-facing individual(s) of a business or organization made to solicit an individual or organization. The individual/organization being solicited has no prior knowledge of the visit. However, the sales-facing individual(s) have done prior research to qualify leads. Doing lukewarm calls requires work on the front-end to determine the people you’ll be calling. Essentially you’re putting together a funnel before your sales funnel. This pre-work is called prospecting. You’re getting together the leads that may actually buy and then calling them to see if they’re at the right point to say yes. In the most generic since about 60% of businesses are NOT interested. The rest of the 40% are still going to be hard to get to, but at least you’re more prepared. One: An agency targets companies with annual revenue between $5 and $10 million, with less than 100 employees. Two: Next, they look to see the current marketing methods of those businesses to determine an approximate budget/interest in marketing. Three: Research is then conducted on potential decision makers and individuals in the company that may handle the types of services that the agency handles (e.g. does the lead have a marketing pro working there, or is the owner trying to do everything). These preliminary research points can help determine if the company has the budget, need, and opportunity to make a connection. All of these indicators help during the call itself too. If you’re a high-priced startup that needs to get on the phone in order to get a yes — lukewarm calling may be an option to get a little momentum. But, even in the startup stage, it’s not the best model for those who aren’t skilled in the art of conversation. If you’re a programmer, expert funnel creator, or introvert, lukewarm calling isn’t going to be your strong suit. You’d be better off letting interested leads contact you. Let’s say you have 500 leads. You call them all over the course of two weeks and you close 3 deals. Great, now the leads dry up. You’ll have to fulfill the deliverables of your new clients (if you’re a service) and likely fall behind on generating new leads. Doing this creates the feast and famine roller coaster that most small businesses ride on continually. Skipping ahead to the call cycle without trying to warm the leads up with other forms of contact is wasteful. You take those 500 leads and burn through them, you’re stuck putting together/buying another list and starting the whole (short) cycle over again. Cold calling is quick, easy, and less effective by the day. Lukewarm calling requires a decent amount of upfront research before calling. Logically, it makes sense to try harder to impress those leads. Sending them something in the snail mail, or giving them a fantastic offer via cold email are just a couple of ways to get the most out of your leads. Don’t just buy a generic list of leads. Buying a list is cool, but it has to be based on a solid ideal client profile. Then, take some time to look into those leads and see which companies may be fishing for a provider just like the stuff you provide. Taking a few minutes per lead may not be viable for everyone, but most B2Bs will see a dramatic positive affect. Have you tried warm calling? What benefits have you seen?